The Heroine’s Bookshelf [Book Review] – my books. my life. Erin Blakemore has done something unique here. She has taken 12 wonderful books and presented them to us in a new light. By choosing one concept that binds the author to her heroine – “Self” for Jane Austen’s Lizzy Bennet, “Family Ties” for Betty Smith’s Francie Nolan, “Steadfastness” for Charlotte Bronte’s Jane Eyre – Blakemore explores the motivations and desires of our beloved characters. Blakemore chooses her heroines wisely. As women readers, many of us grew up surrounded by the same books. Books like Little Women, To Kill a Mockingbird, and Little House on the Prairie. Revisiting them through their authors offered a new way to look at them. 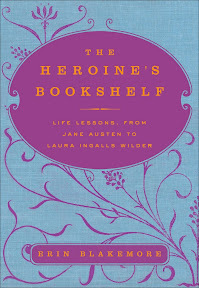 I hadn’t read all of the books discussed in The Heroine’s Bookshelf, but I enjoyed those essays just as much (and I fully intend to read them all now – but don’t hold me to it when I fail). I found myself dipping into one or two essays at a time and then putting the book down in exchange for others. The Heroine’s Bookshelf was perfect for this style of reading. While the compilation is cohesive, each essay stands on its own. If you love these heroines as much as I do, pick up this book and enjoy. I enjoyed this book as well – it made me want to read or re-read all of the books discussed. Since reading it I’ve read Their Eyes Were Watching God for the first time, and I re-read A Tree Grows in Brooklyn and the first two Little House Books. Next up is Claudine, or perhaps re-read Anne of Green Gables. I can never resist Anne Shirley. I thought this book was clever and well done. Nice review! Perhaps she has tapped into why exactly we love all of these books. I am just dense enough to say that I love them, but not know exactly why. This sounds like the perfect book to have sitting in my car for a quick pick-me-up. I am also eager to read this book, and although I have not read all the classics behind the book, it seems like it would make for a great read. I also love that it can be broken down into pieces for easier reading. I am going to have to move this one up on my list! I am so glad you enjoyed it (and finally finished it). I got this for Christmas and have yet to read it! I like the idea of each book/character she highlights having a different theme. I knew you would love this one! You are absolutely correct; Blakemore’s style makes it easy to read one or two of the essays and put it down for a while. You don’t lose anything by doing so. As I re-read each of the novels she mentions in her essays, I will definitely be going back to the appropriate essay for her thoughts. I’m so glad you finished it and, more importantly, enjoyed it!